You are here: Home » Are you really ready for the world to be ruled by bankers? December 19, 2014 | General Maddox | Comments Off on Are you really ready for the world to be ruled by bankers? Are you really ready for the world to be ruled by bankers? 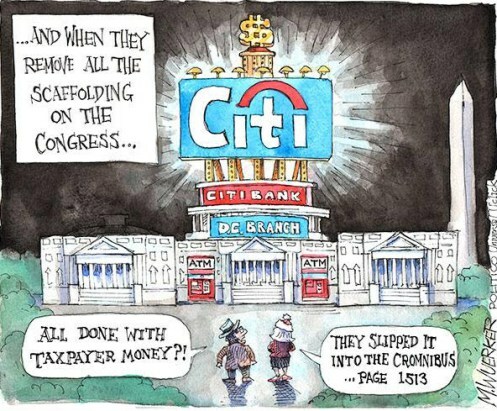 Believe it or not, Citigroup announced on Friday that it would move its headquarters from New York to the actual U.S. Capitol Building, in Washington, D.C., in early 2015. Yes! They might as well had since they got everything they wanted… Could you imagine. Citi outbid JP Morgan and Goldman Sachs to lease thirty thousand square feet of prime real estate on the floor of the House of Representatives. This is just jumping off the cliff. Not only did these people grease enough palms to repeal Dodd Frank, they are now virtually leasing space right in the Capital Building and managed to increase the donation limitation from $32,400 to $324,000. They own Congress.